The Drone Campaign Network shall be working with other peace and human rights groups to challenge the use of drones in this way. We have launched a petition calling on the government to stop using drones to carry out targeted killings and to explain publicly what it sees is the legal basis for such killing. You can sign the petition at Change.org here. You can also download a hard copy to sign and get others to sign here. The government insists there is no difference between drones and other aircraft but multiple studies have raised significant ethical and legal questions and the APPG is arguing that these difference mean there needs to be a distinct policy on the use of armed drones. Please ask your MP to sign it. 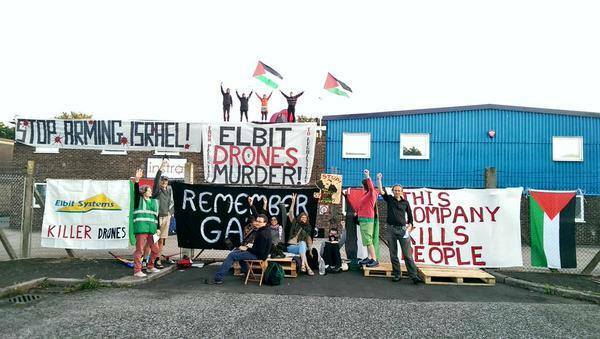 On 6th July 2015, Israeli-owned Elbit drone factories were shut down by protesters in Shenstone and Tamworth in the West Midlands, in Broadstairs Kent and in Melbourne Australia. 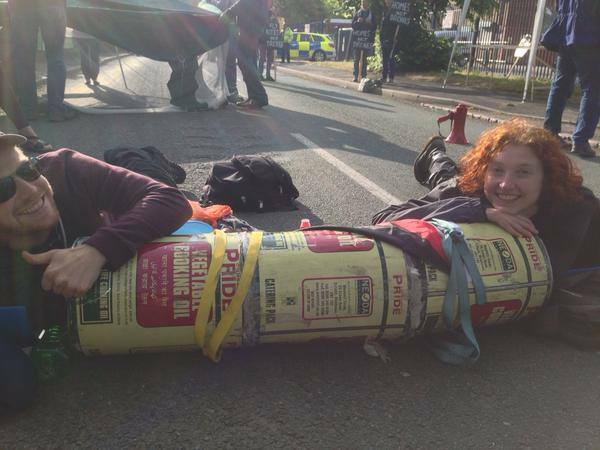 At Shenstone there were 19 arrests and protesters were detained for 24 hours but, at the time of writing, the police have not decided on charges. A private security company tried to hand out an injunction, naming the 9 roof top protesters from a year earlier and any persons unknown who were within 250 metres of the factory. The police eventually pushed everyone half a mile down the road. In Broadstairs and Tamworth, despite people on the roof, there were no arrests. At the eleventh hour, the trial of the 4 protestors who broke into RAF Waddington in January was postponed to 19th and 20th October. Late afternoon on 26th May, just hours before the trial was due to start, the group were successful at their third attempt in moving the date. Instead of half a day, the trial has now been given 2 days so that more time is available for expert witnesses. June the 4th saw the second Drone Against Drones street protest in Hastings, aimed at highlighting the menace of unmanned aerial vehicles, which have been the cause of increasing numbers of civilian deaths in recent years. The 4th June protest featured local people marching from the Pier to the Old Town in Hastings while ‘droning’ on musical instruments. As the procession moved down George Street people filmed it on their phones and some even applauded! Drone Against Drones is the idea of musician and campaigner Rob Hill, who commented ‘It was great to see more people at the second Drone Against Drones and now we’re looking forward to the National Drones Week of Action in October.’ The march ended at the Royal Standard pub with music and speeches. Local activist Maya Evans spoke, having just returned from Afghanistan. She described an incident in which, due to faulty intelligence, a group of civilians were hit in a drone strike launched thousands of miles away in the Nevada Desert. UK-wide demonstration on Afghan New Year: Fly Kites Not Drones! Strong winds blew kites high for the Fly Kites Not Drones Day of Action on 21st March. Across the UK in towns and cities, parks and fields, on beaches and outside military bases, concerned individuals flew kites and remembered the children for whom blue skies means better visibility and therefore the danger of drone attacks. As far as we know, there were activities in Argyle, Axbridge, Bournemouth, Brighton, Dunblane, Edinburgh, Findhorn, Hastings, London, Loughborough, Manchester, Sheffield, Southampton, Stockport and Waddington. Flying kites is a universal, simple pleasure: the exact opposite of the high tech terrorism of drones. The Drone Campaign Network (DCN) wants the skies to be safe for children now, for the children of the future and for all of us. 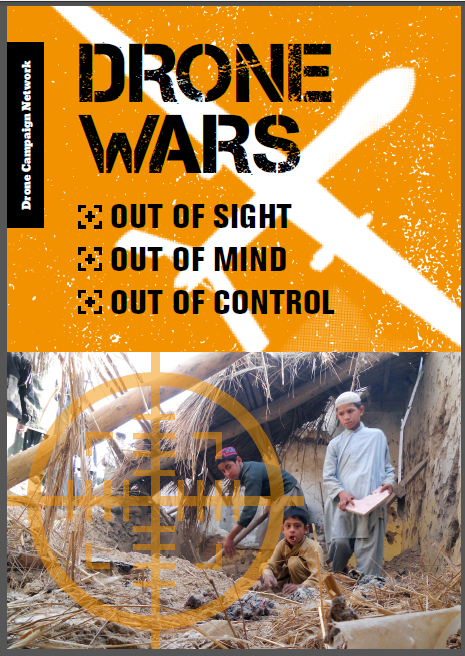 The DCN is working with several of its members – Quakers, Pax Christi, Voices for Creative Non Violence UK – to produce a Fly Kites Not Drones pack for schools. There will be a chance to see this at our summer conference on 11th July and it will go into schools in September 2015. For more info on the Fly Kites Not Drones initiative, visit the Webpage, Facebook page or Twitter account. 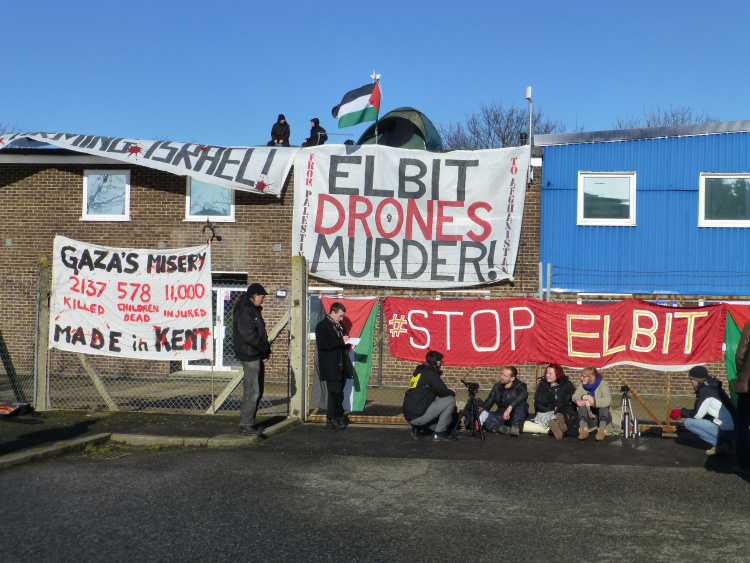 On Tuesday 17th February the Elbit factory in Broadstairs, Kent was closed for the day when protestors climbed on the roof and ‘D’ locked themselves to the gate. They attracted great publicity locally and nationally. 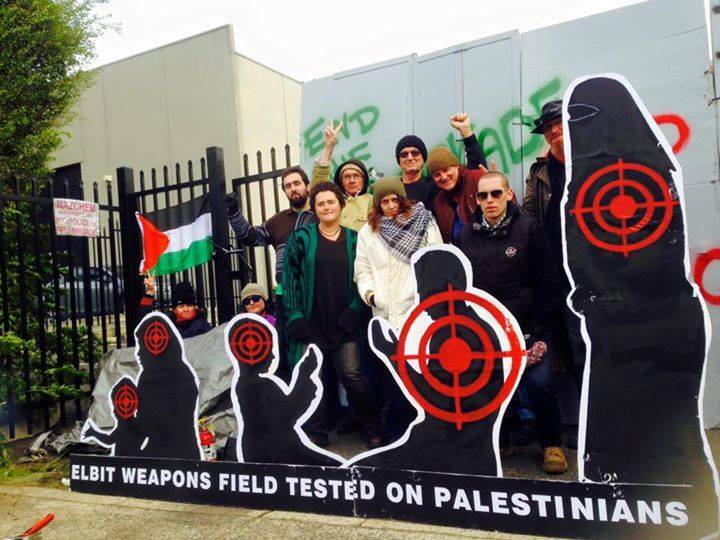 Elbit workers were told to stay away from the factory and no-one was arrested, despite the obvious offence of aggravated trespass. Clearly Elbit do not want to have to defend their drone activity in court. For a report including more photographs and a short film see here. The sound that frightens children in Gaza was heard this afternoon in Shenstone near Lichfield. More than 50 academics, clergy, members of religious orders, and people training for ordination in the Queen’s Foundation for Ecumenical Theological Education in Birmingham gathered for an act of public worship against the UAV Engine factory in Shenstone. This is a factory owned by an Israeli arms company making parts of engines for drones which are heard over the Gaza Strip. A recording of the sound of drones over Gaza was broadcast towards the factory. 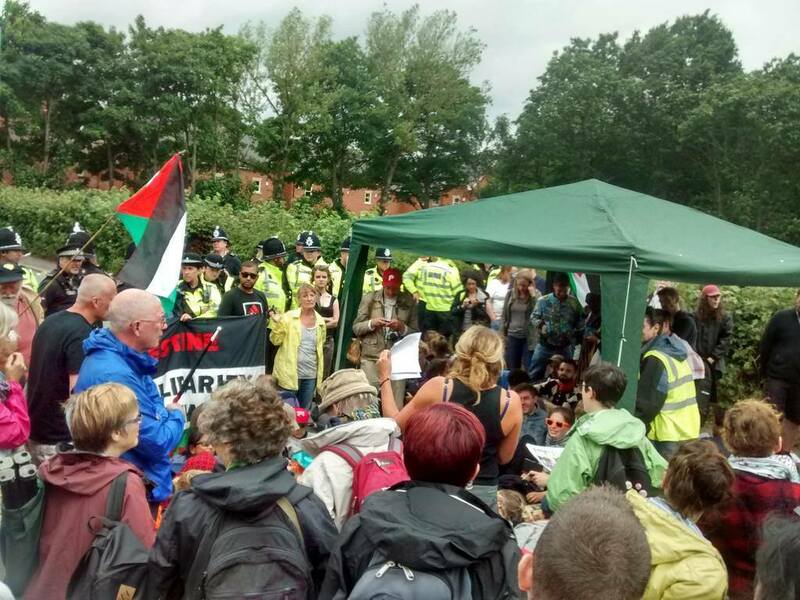 The trial of the nine protesters who closed the Elbit factory in Shenstone last August has been dropped. The charges were dropped by the Crown Prosecution Service just hours before a deadline expired to provide the defendants with details of arms export licenses granted to UEL to send its high-tech engines to Israel for use in the Hermes 450 – a drone widely deployed by the Israeli military. The full report in today’s (31st Jan) Independent is here. • You can see the most recent edition here. • Sign up to receive the newsletter here.